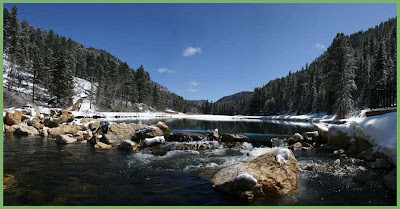 Life in the Black Hills of South Dakota provides a wonderful variety of weather and scenery. It seems we've been blessed with April storms for each of the past three winters -- and 2008 was no expection. Pictured here is a holding pond on Spearfish Creek just southeast of Savoy. The April 5-6 snowfall left several inches throughout the northern hills, and a Sunday morning drive up Spearfish Canyon provided some delightful sights and a few good photos.